When Sol and her little sister Ming moved from the Philippines to the United States, they knew their lives were going to change. But they didn’t realize that they would be abandoned by their father and stuck living with Vea, their mean stepmother in a tiny apartment in Louisiana. Now five years later, Sol manages to escape her stepmother’s cruelty by escaping into stories, particularly when she is sent to the closet when she has done something wrong. She shares the stories with her little sister and Ming has now started to believe in their mythical Aunt Jove and expects her to arrive to rescue them. As Ming’s hope grows, Sol despairs of their lives ever improving at all, but friendship comes from unexpected places and may be the answer to their hopes and dreams. Kelly, author of Blackbird Fly, has created another great novel for children. In this book, she beautifully captures the complexity of the lives of some children where their families have been turned upside down through death and abandonment and they are left with those who don’t love them at all. It is a book about hope as well, about the power of stories to create new realities and the radiance of hope even in the bleakest of times. What gloomy tales we had, I thought. I wondered what we’d look like to someone passing by. Two twelve-year-old girls – one so white she looked like a ghost and the other so dark she looked like the fields – sitting on milk crates and telling sad, sad stories in the hot, hot sun. These are stories of poverty, of spending time on the streets to get out of the misery of your home. The novel dazzles with its truth and honesty of children who shine despite the darkness in their lives. A powerful novel of stories and hope and how they can be used to overcome the darkness that life contains. Appropriate for ages 10-12. 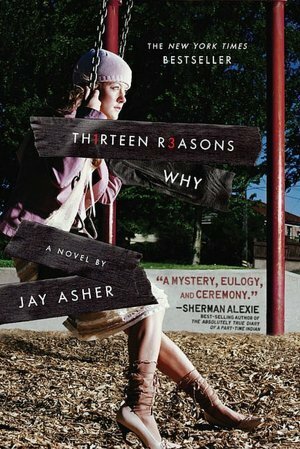 In a project executive produced by Selena Gomez, the teen novel 13 Reasons Why is going to receive the Netflix treatment and be turned into a series. Deadline has the news that Tom McCarthy, director of Spotlight, will direct the first two episodes of the series.